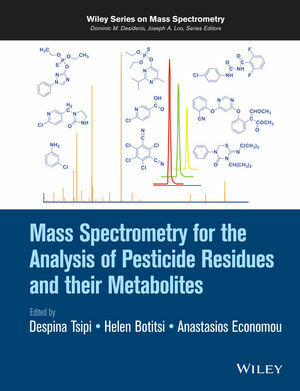 Provides an overview of the use of mass spectrometry (MS) for the analysis of pesticide residues and their metabolites. Despina Tsipi is the Director of Food Safety & Quality Laboratories (including the Pesticide Residues Laboratory) of the General Chemical State Laboratory, Athens, Greece. She holds a B.Sc. in Chemistry and a Ph.D in Photochemistry from the University of Athens, after a doctoral fellowship in NRSC Demokritos. She works in the field of pesticide residues analysis in foodstuffs and environment using hyphenated MS techniques for over 20 years. Between 2003-2006, she joined the Panel of Plant Protection Products and their Residues (PPR-Panel) of the European Food Safety Authority. She is a founding member and current president of the Hellenic Mass Spectrometry Society. Helen Botitsi is the Head of the Pesticide Residues Laboratory, a National Reference Laboratory of EU for pesticide residues analysis in foods of plant and animal origin of the General Chemical State Laboratory, Athens, Greece. She holds a B.Sc. in Chemistry and a Ph.D in Biochemistry from the University of Athens. Her main field of expertise is method development for pesticide and pharmaceutical residues analysis in foodstuffs and environmental samples using GC-MS and LC-MS techniques as well as method validation and quality control. Anastasios Economou is Associate Professor at the Laboratory of Analytical Chemistry, University of Athens, Greece. He holds a B.Sc. in Chemistry from the University of Athens, a M.Sc. and a Ph.D in Analytical Science and Chemical Instrumentation from the University of Manchester. His research interests are focused on the development of electrochemical, spectroscopic and chromatographic analytical methods as well as the development of automated analytical systems.